Blendtec is celebrating their Memorial Day Sale 2017 with special VIP Pricing. 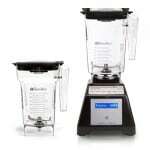 They normally put their reconditioned blenders on sale, but not this time, they’ve got BRAND NEW BLENDERS ON SALE. Which one to choose? They both have 3.0 horsepower motors, but the capacitive touch-screen that comes with the Designer 700 is my choice. It’s only a little bit more money, but you get the newer motor base that is a little bit quieter, as well as the much more versatile capacitive touch screen interface. The sale ends May 31. 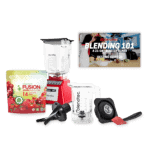 But one thing about Blendtec, when they run a sale, it’s only for limited quantities. When they run out, they run out. I’ve had readers complain that they missed a sale, or they ended up having to buy a sale model in a different color than they wanted. Order early to lock in the sale price and your #1 color choice.